Mom of five, Zari Hassan, is caught up in a very complicated situation that is only getting worse and not showing any signs of getting better. A few days back, Diamond Platnumz and Zari were in the UK and while there, they celebrated the decision of court to throw out the child neglect case that Hamisa had filed. The power couple had to pop champagne over that. Zari was the whole of yesterday very confused after learning that her baby daddy who also doubles as Hamisa Mobetto's baby daddy has yet again another child putting the known number of his children to 7 including the late Ivan Semwanga's. "So y'all are breaking records for how many baby mamas and babies you got and not how many hit records you're selling, SMH! Someone call for condom endorsements...To whom it may concern, #RealTalk." 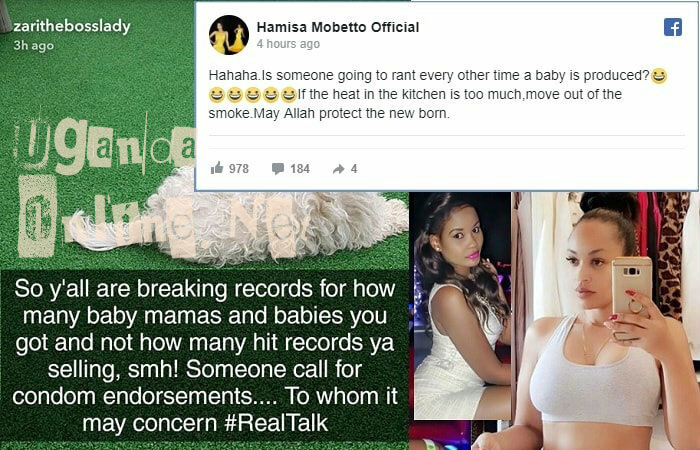 Hamisa Mobetto is having the last laugh and asking Zari to quit the kitchen if she can't stand the smoke, she's been on the side for way too long..
Of course after these two celebrating over her loss, she could not help it, but laugh sarcastically, she also wondered if Zari will be throwing stones at every baby her baby daddy brings to this world. It should be recalled that while admitting to fathering Hamisa Mobetto's child, Diamond Platnumz said that his religion allows him 4 wives after all, all the women should be understanding and co-exist. "If the heat in the kitchen is too much, move out before you choke on smoke." HAMISA Mobetto added. "Allah protect the newborn," She concluded. Meanwhile, before this, Zari was having to deal with the issue of Diamond Platnumz meeting Hamisa Mobetto coincidentally in Dubai, that equally took a toll on her and knowing these two, they are capable of doing so much when together, so Zari did not consider Hamisa Mobetto's explanation that she never met him. Hamisa reminded her though that it's high time she gets used to seeing the two of them together, because now that they have a child, they will be meeting once in a while.